Bunker Hill Publishing Inc, 9781593731533, 32pp. This is the true story of Fu Manchu, an adult male orangutan, who relishes outsmarting his friend, zookeeper Jerry Stones. He does just that when he escapes his enclosure at will and spends sunny days with the elephants in another part of the zoo. At first Jerry believes his staff's carelessness allowed the crafty ape to get out. But when that assumption proves wrong, he launches an all-out surveillance mission to discover how Fu manages his getaways. Jerry soon discovers that Fu can open the locked door, but can't figure out how he does it. The zookeeper removes every twig and stick that could be used as a lock pick, but Fu continues to escape. Eventually, Fu reveals to Jerry how he did it, and is rewarded with honorary membership in the American Association of Locksmiths. Laurel Neme has camped in the Kalahari, searched for peregrine falcons in the Arctic, and gotten lost in the Amazon jungle with the Brazilian Federal Police, all in pursuit of knowledge and a good story. She often uncovers true animal tales, like this one, that strike her funny bone while providing insights into a species. She is a contributor to National Geographic and author of ANIMAL INVESTIGATORS.Orangutan Houdini is her first book for children. Kathie Kelleher is descended from a long line of talented and interesting characters, from bell-helmeted deep sea divers to Cape Breton bagpipers. As a young child, Kathie enjoyed hearing the family tales. Some tall, some small. All entertaining. She studied at the Paier College of Art in New Haven, CT under such luminaries as Dean Keller, Ken Davies and John Massimino. She has illustrated several books including Willow's Walkabout: A Children's Guide to Boston. 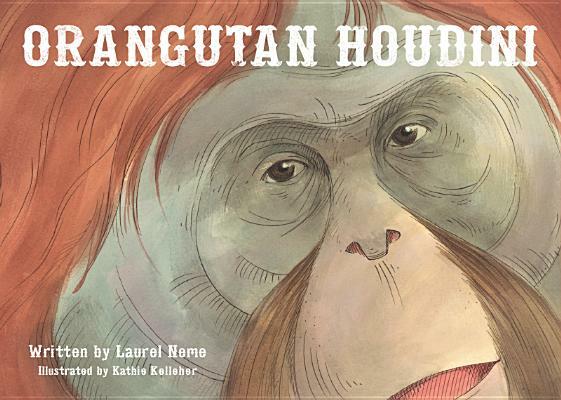 Orangutan Houdini the children's picturebook adaptation of a true story about an ape escape artist! Fu Manchu was an adult male orangutan with an uncanny talent for picking locks and evading his zookeeper, Jerry Stones. Fu Manchu never hurt a soul on his escapades; he qimply enjoyed the chance to climb trees in the sunshine. For his talent at concealing and using a makeshift lockpick he was awarded an honorary membership in the American Association of Locksmiths! A brief, two-page author's note at the close of the story offers more details about Fu Manchu's remarkable life. Colorfulf illustrations enrich this amazing tale that primate fans youngwmd old c4 shale and eljoy.